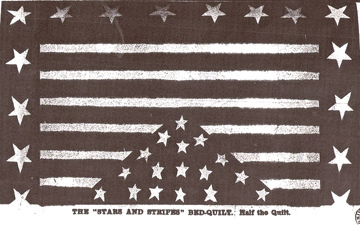 In July, 1861 Peterson's Magazine published a color sketch of "The Stars & Stripes Bed Quilt". The full-page design showed half the quilt. 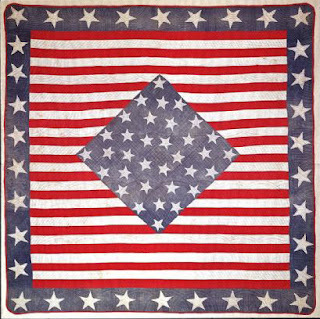 It's the earliest color quilt pattern yet found in an American periodical. ---the best image I could find. 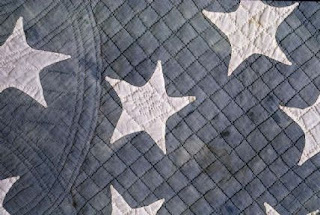 The center showed 17 stars, half the official number. 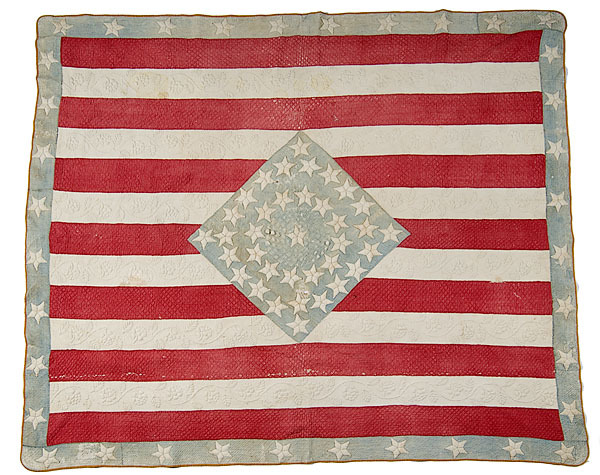 The new state of Kansas had recently joined as the 34th Star. 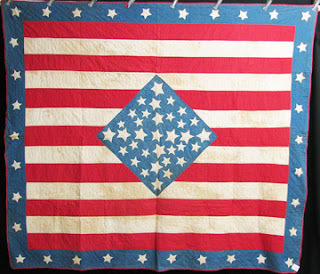 Several quilters were inspired to make up the design. And each treated the center in different fashion. These two are from online auctions. 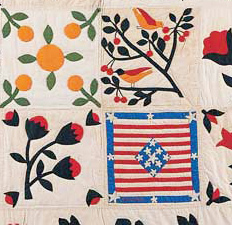 Above is a block in an appliqued sampler from the collection of the American Folk Art Museum. 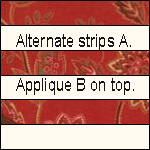 Because many of you followers are new to applique I thought it would be best to simplify this block. 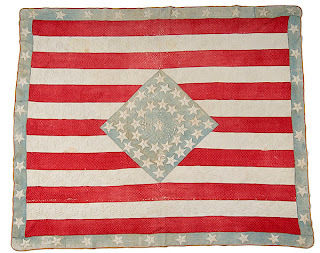 One star/ six stripes! A Cut 3 red and 3 white rectangles 1-7/8" x 8-1/2"
Add a seam allowance for applique. trim it to 8-1/2" after appliqueing the star. There's something wrong here with the link which I am trying to work out. Try this link. And someone suggested-- -if the link takes you to the wrong page just type the link above into your web browser. Peterson's Magazine, like Godey's Lady's Book, was a women's periodical with fashion, fiction, household advice, craft patterns and decorating tips. Things haven't changed much in the women's magazine business. which was where the Stars & Stripes pattern was found. 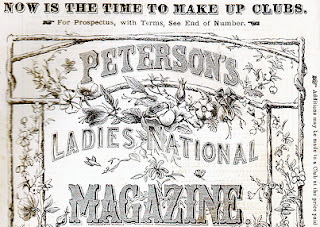 Peterson's began publishing in 1849, using "Clubs" to expand their subscription list. 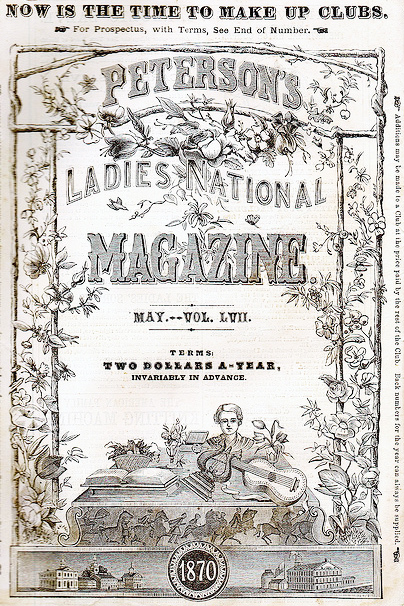 An 1870 cover highlights the subscription clubs. Mary Kemper Vermilion, living in Iowa with family while her husband fought for the Union, wrote him of all the neighborhood happenings. 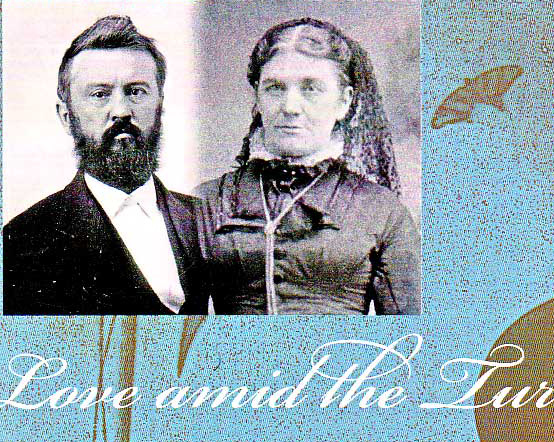 The link for the star PDF takes us to a Civil War Crossings pattern. There has been a mixup with the links. Where's the star pattern? 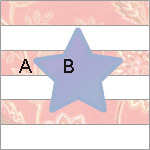 I clicked on the PDF and got a jelly roll pattern...which I liked but it doesn't help me with the star. I think I fixed the link problem. Sorry for the mixup. Thank you, again for all the work you do to bring us this wonderful info. 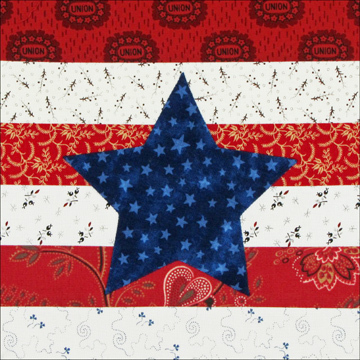 It looks like everyone is having fun with this star block, with so many variations! 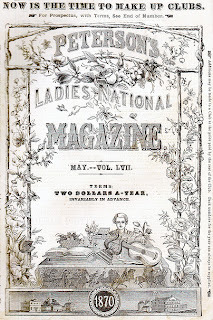 Very interesting post about the magazines of the Civil War era. I completed my block and posted it on my blog along with a how-to. Thanks for the bit of applique! It's always welcome. 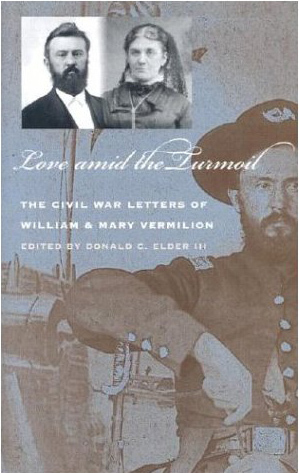 You inspired me to research what life was like in my hometown of Brooklyn NY during the War. I found this delightful letter that references soldiers and baseball from July of 1861 in the Brooklyn Public Library's online archives. I love this weeks block! I can't wait to make it. The originals are so interesting with the stars in different arrangements. Thanks for posting one that is simplified. 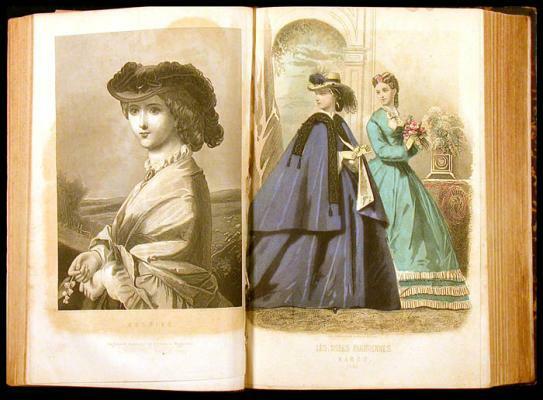 Very interesting about the magazines too. I love that Peterson quilt. I made my own version of a similar one on display in Norwalk, Ohio. This quilt always catches my eye whenever I see it in a book or magazine.